Hi, I am a support guy, haven't really ever used CAD software. 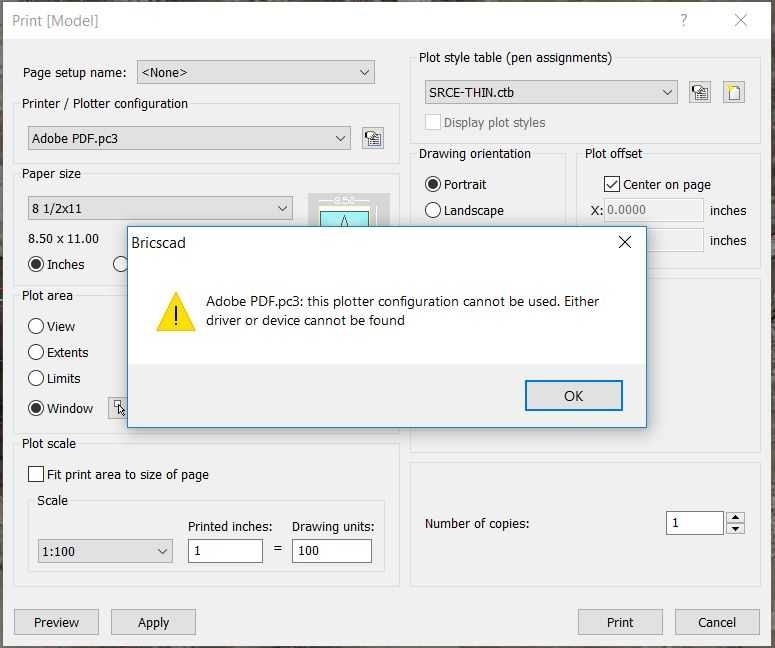 I received a call ticket today about someone using Bricscad and said she got an error when trying to print to the Adobe PDF.pc3 profile. When I click on the printer/plotter drop down the Adobe item is there. There is a directory where some of those files are stored. The attached file is what appears when she tries to print. Being that it is Windows 10, adding a printer with "have disk" and pointing to that folder isn't an option. She has Adobe Acrobat 10 on her computer. There are inf files in Adobe/xtras (I think it is). I've been all over Google and haven't been able to find the answer I need. If anyone can tell me how to make printing to Adobe an option again please let me know. The screen shot is attached for reference. I found this information on the internet, but dont know if it is of any use for you. Why not install and use one of the free PDF printers? I use Primo PDF all the time. You can also use the BricsCAD built in PDF printer. File > Export PDF. And the settings for the PDF export, you find under File > Export Options. Since BricsCAD V17 using the built-in PrintAsPdf printer device is the easiest way to create optimal PDF files. My preference has been to use Adobe PDF as the printer driver for my plots because I have multiple lisps and scripts that automate the process. Where do I find the location to submit a support request? Bite the bullet and use one of the free apps available. Adobe products seem to be the worst at handling this?! Try Paperless Printer, Foxit or PDF995 all great. And you're not feeding the Adobe monster. Select "Adobe PDF" as the printer/plotter configuration rather than "Adobe PDF.pc3." It may be that the .dwg file originated on a different computer. A .dwg file brings the user's printer selection with it, as well as their selection of a plot style table. But the items selected may not be available on the target computer. In that case you have to get the files from the source computer (often difficult or impossible), or just select something else that IS available.